to accent our family room. challenged me to use color. Kate is a neutral girl! I really had my work cut out. in our home before she puts on her new dress! of performance anxiety I have ever experienced! a few months prior so that was my start. that had been handed down. summer whites and bring out more of the darker grays. That table looks like an old barn door ~~~~LOVE~~~~ this! 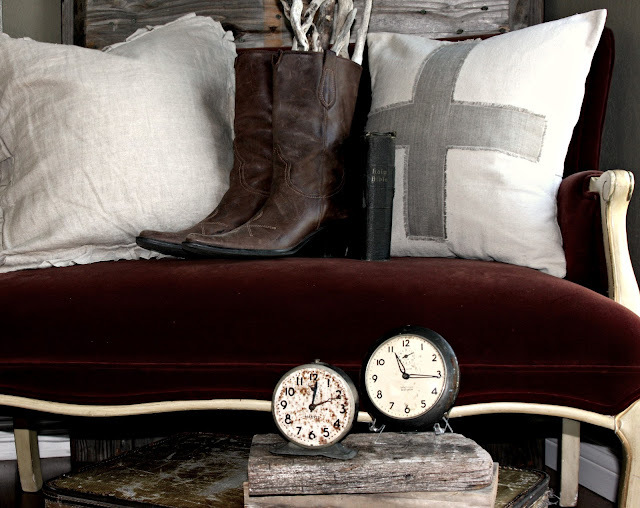 Beautiful velvet settee! Super cool boot! Pillow are fab looks amazing! This is gorgeous, too gorgeous for words. Velvet rich and screams fall!!! I love how you have dressed her and really love how you used the cowboy boots! She's beautiful. You did a fantastic job making the color work for your decor. 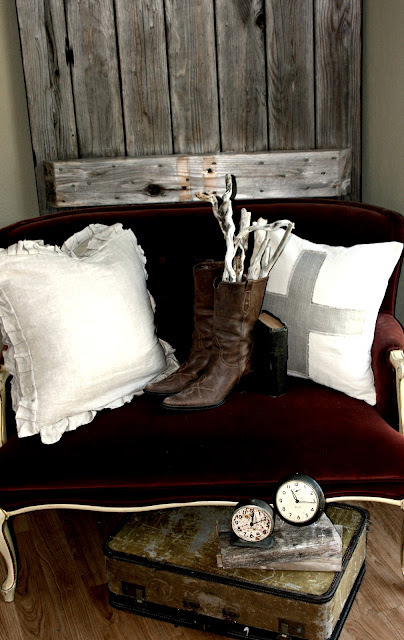 The cowboy boots make a great centerpiece. I knew you could do it! You are always the inspiration to me, so glad I could return the favor! :)) It looks so beautiful and I freaking love the cowboy boots!!! Good choice. The velvet is perfect. A divine pairing of beautiful treasures! I love how your mind works!!! How exquisite! I love your color preferences. Calm yet....there's depth. Love it all! Wow! I think you did beautiful! I love the whole vignette. I really don't think you could mess anything up, though. Great find- she is beautiful! It is so lovely, Kate. I love the beautiful, rich color! You did good! 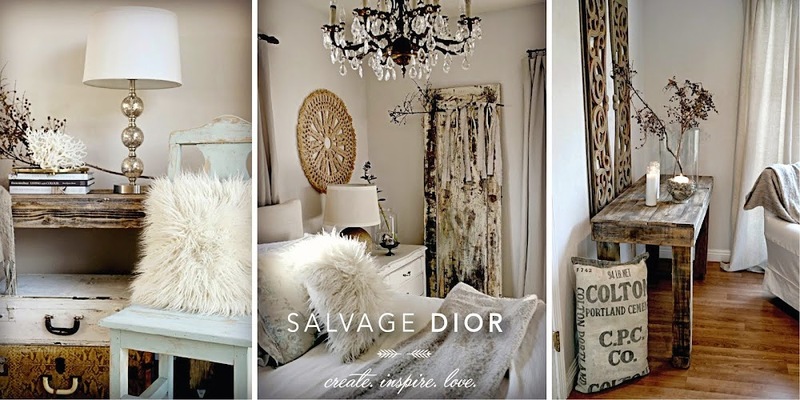 It's absolutely lovely, and I love the mix of the dressier settee with the distressed woods and accessories. Perfect! This is the most amazing find! 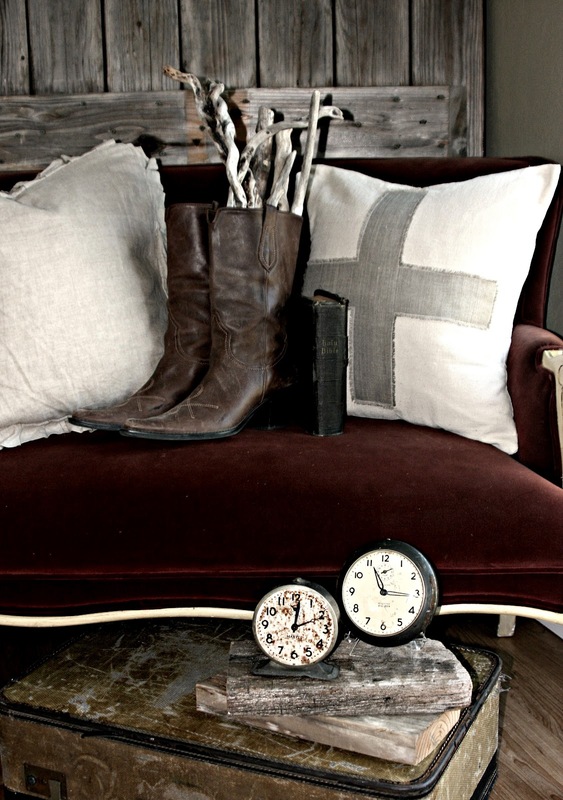 We never have items like this settee! The reclaimed picnic table is amazing! You have a gift for design! I always enjoy seeing your lovely posts! it doesn't get any more scrumptious than rich brown velvet! it's gorgeous, just lovely! Mmm...blood red velvet with grey...beautiful. If you do keep it the velvet thru the holidays, I can only imagine the Christmas magic it will become. When and if you get it redone...hang onto that old velvet...it's dreamy. OH it is lovely, Kate...and perfectly beautiful for fall! 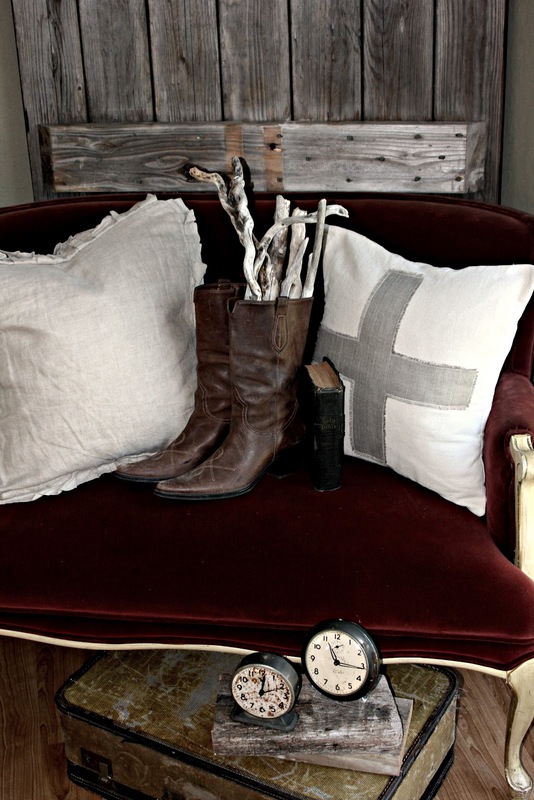 I have several pieces that need to be reupholstered, but you give good advice here. Live with it for a while. It's beautiful. I hope you have a beautiful Friday! She is beautiful, you did an amazing job!! 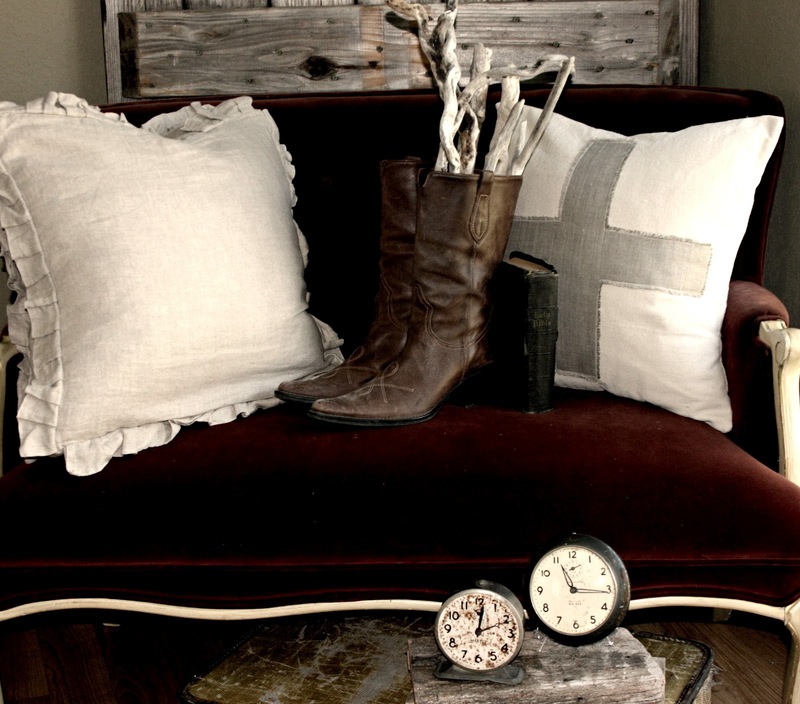 I love driftwood everywhere, what you did w/it is so cute, Kate! Have a great weekend, you really should have your own show. Hi Kate! LOVE this:) Now THIS is thinking outside the box! Great job. What a beautiful find ~ I love what you have put with it! I love this, the rich velvet and rustic elements, I love,love texture! Kate, love the settee and the picnic table top. The color is great for Fall. How clever to put lovely driftwood in your boots. Thanks for sharing with SYC. I just KNEW you were going to say that this came from your magical Goodwill store!!! I swear, if I ever need to locate any unicorns or leprechauns, I'm headed there....they have EVERYTHING else!!! I am not a gray person at all... but I DO love what you DO with this color...and to pair it with the velvet is beyond stunning! Gorgeous look from my gorgeous friend! Sending you huge hugs, Kate. What a gorgeous mix of texture and color. And you styling is beautiful!